This past week I was in Nashville where we discussed building interactive scenarios. Part of the discussion revolved around designing some simple scenario strategies to move the projects away from linear elearning and towards meaningful interactivity. The ultimate goal is transitioning from a push model where we just provide information and move to a more interactive model where the learner makes the same types of decisions she’d make in a real-world environment. These decision-making activities are used to reinforce what you want her to practice and learn so that your courses have real-world impact. Challenge: The goal is to engage the learner and challenge her understanding. Present a situation, get her to process some information, reflect, and then let her make a decision. 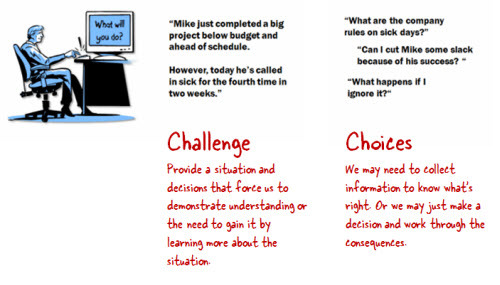 Choices: Once the learner is challenged, she needs to make a decision (or series of decisions). Provide some choices to work through the challenge. The choices should all be viable and realistic options. Don’t waste time on meaningless choices. Consequences: Each choice produces a consequence. Sometimes the consequence may lead to immediate feedback; and sometimes it may lead to additional challenges that compound the situation. We don’t usually get immediate feedback, unless of course you stick a finger in a wall socket. So stacking or delaying the feedback can make the learning experience much more dynamic and more true to the way things work in real life. There are a few different ways I use the 3C model to template the interactive scenarios. In today’s post, we’ll explore what I see as the more complex type of branching. Some elearning courses are more like marketing pieces. In those cases if all you need to do is share information, then a branched interaction is probably too much and can frustrate the person who has to take the course. So let’s assume you’re teaching to improve performance. Performance-based courses usually come in one of two flavors. There are courses that teach procedures, like the ten steps to loading a widget. And then there are courses that teach principles that guide decisions, like much of the soft skills training. Most likely you’re not using branched interactions for training on simple procedures. Those are easy enough to show and then get people to practice and demonstrate they can follow the procedures. Branched interactions come in handy when you have nuanced situations and are trying to help people think through them and make appropriate decisions. You’re less focused on the specific, step-by-step procedures and more focused on principles that guide decisions. If you want to build a complex branched interaction, look at the 3C model as a single building block, kind of like a Lego brick. For each consequence link to a new challenge. In that way you’ll get a branched interaction that looks something like the image below. We rarely have to make clear right-wrong choices when dealing with people or situations. Many of the decisions we make are nuanced. And a solution that works in one situation may not work in another. Because of this complex branched interactions are great for getting to the heart of the principle that you’re teaching. There are a few challenges with complex interactions. The first is that they take a lot more time to develop. So if you’re pressed for time, then you may want to look at a more streamlined approach. Another challenge is that it’s hard enough to get your subject matter expert to give you ten good multiple choice questions. So imagine the difficulty in getting them to help you work through a complex scenario and all of the nuances. If you’re not the content expert, you’ll need to figure out who’s going to help you through the content to craft relevant and meaningful interactions. The first two challenges can be overcome by allocating more time to develop the course and more time to work with the subject matter expert. But this next challenge is a bit more difficult to overcome, and that’s the matter of creativity and good writing. A complex branched scenario is a like a story. We can all write; however that doesn’t mean we are all good writers who can craft compelling interactive stories. This takes some practice and creativity. Keep the scenarios simple. The less complex they are, the less you get tangled in a lot of extra script writing and scenario building. Review what makes a good story. Learn about storytelling and how to compose them. And when you think through your scenarios, determine how to follow a storytelling model. Here’s a good site that has all sorts of resources on storytelling and here’s a list of books. 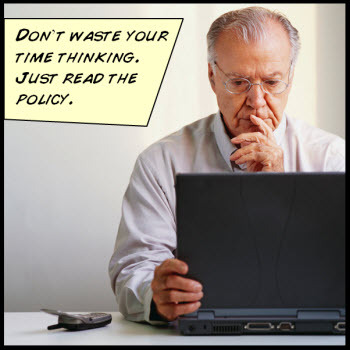 Take a creative writing class to help think in a different way. Elearning courses tend to have that corporate voice that read more like they were written by lawyers and not real people (although it’s been alleged that lawyers are real people). By taking a creative writing class, you’ll learn to write with a different voice and learn to look at what you write in a different way. Scenario-Based Learning. Goes into the heart of storytelling with lots of practical tips & examples. Performance Consulting. Decision-making scenarios are great when linked to meaningful objectives. Working with your client to understand their goals and identify the gaps in understanding is a key part of it. Designing Successful E-Learning. A great book that gets to the heart of instructional design. Another must-read book. Made to Stick. Not an elearning book, but a book about crafting sticky messages and compelling stories. Learning by Doing and Simulations & Serious Games. 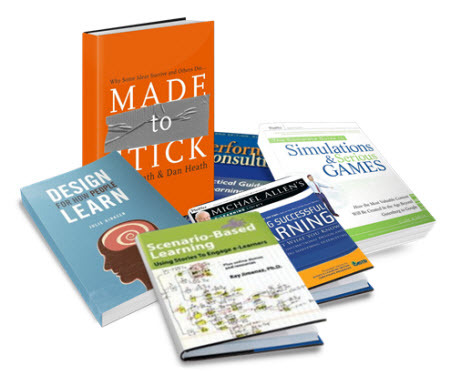 I’m a fan of Clark Aldrich’s work because his company builds interactive simulations. He covers content a bit more involved than what most rapid elearning developers do, but it’s good stuff to learn and think about especially if you want to grow. Are there other good books you’d add to the list? If so, add it in the comments section and tell us why it’s a good book. There’s a reason a lot of elearning isn’t more interactive. We have limited time and lack of access to the subject matter expertise needed to craft good scenarios. But using interactive scenarios can transform what might be a boring click-and-read course into a dynamic and effective learning experience. So if you haven’t tried to build one yet, give it a shot and see how you do. If you’ve built interactive branched scenarios in the past, what tips would you share for the person just getting started? Share your tips by clicking on the comments link. Microsoft is Dumping Clip Art. What Are You Going to Do? What’s the Best Job Title for Those Who Build E-Learning Courses? I’ve seen folks struggle with tracking complexity when writing scenarios. This usually results in falling back to a simple position, or worse – setting up rabbit hole navigation requiring the learner to read each branch to continue. I think this can be solved with practice and iteration. Tools can make this easier if you can remove all of the fluffy stuff and visualize the connections between nodes. I’ve been using a tool called Twine for a few years now that does a dynamite job of mapping out events, actions, and dialog in a no-frills output. The tool is available on Mac and Windows. The output is a single HTML file so you can post or send around for feedback as you generate the story. It also supports expressions and variables so you can pretty easily approximate stuff you could execute in a tool like Storyline. @Steve: good stuff. Twine’s a good tool. I like to use the mindmapping products that output to PPT. This way if I build the scenarios in PPT I have a good start for placeholder screens. And of course I can import those screens in Storyline, too. Help! I have created branched scenarios before, but I need to present an outline of the branched scenario I have in mind to someone who isn’t that familiar with the concept. I’m trying to think of a way, a tool, a template, something to help me get my ideas across. Any suggestions? Thanks. Quandary is an application for creating Web-based Action Mazes. An Action Maze is a kind of interactive case-study; the user is presented with a situation, and a number of choices as to a course of action to deal with it. On choosing one of the options, the resulting situation is then presented, again with a set of options. Working through this branching tree is like negotiating a maze, hence the name “Action Maze”. I have used Quandary (no longer supported but free and never breaks!) for many years – great for re-imagining those confusing VISIO processes and great for rapid wire-framing! @Susan: using a mind map tool is an easy way to show the flow of a branching interaction. There are a few good suggestions in the comments. Thanks for this article Tom. I find often the way we implement interactive learning is dependent on the capabilities of the LMS we are using. As an online LMS company – I will often set aside time for training new customers in how our system can be used to implement these interactive scenarios you are referring to. I will definitely be building your thoughts into how my LMS works when training clients in how to get the most out of our system. Linear and non-linear models can be used to improve learning. They can actually be used together at times, depending on the context (goals, objectives) of the course. I like how you used widgets. I always thought only professors use that term. I have an objection to the article. I don’t like that you used only “she” when narrating your article. I in turn am a man. Tom, you know better than that. Excellent post! It was exactly what i needed today, i´m just starting a project based on a scenario and it really helped me to develop my proposal. Let me suggest the book “Zen Design” by Garr Reynolds, it is about planning, design and storytelling. Nancy Duarte’s book Resonate: Present Visual Stories provides some great information on storytelling. It’s geared toward presenting, but I found a lot of useful information that transfers. @Laura: The Resonate book is a good one. I should have added that to the list. Here’s a presentation she did on the book. Great article Tom! I hope to incorporate this concept into my upcoming project. Do you have an example of a course you’ve designed using the 3C concept? I just started writing a branching scenario and visions of my favorite books a child started running through my head. It was Choose Your Own Adventure of course! Then I see the “modern” version of that which is role playing games that have progressed into incredibly sophisticated branching stories that change every time a person logs into their computer. This has given a new and more interesting perspective to some rather mundane subject matter. Thanks so much for sharing these insights! Oh and I checked out Twine and it looks like it would be super useful as well!